The key to stopping a campfire from smoking lies in knowing what kind of wood to use and its condition before starting. Using wet wood will most likely result in a smoky fire. Some woods, such as poplar, elder or robinia, even when dry, will also result in smoky fire. The ideal type of fuel (wood) you need is hardwood (oak, eucalyptus, ash, cedar, citrus and others). Although it may take longer to ignite, it burns more slowly and will give you a clean-burning fire. Use a fire ring if available. If not, choose a campfire location away from accumulated dry wood or trees with low overhanging branches. If possible, start your fire on a previous campfire site. Clear the campfire ground area of debris, dry leaves and anything that could ignite easily. Collect the wood for the campfire. Use fat wood–small pieces of dry softwood like pine and birch–for starting your fire. 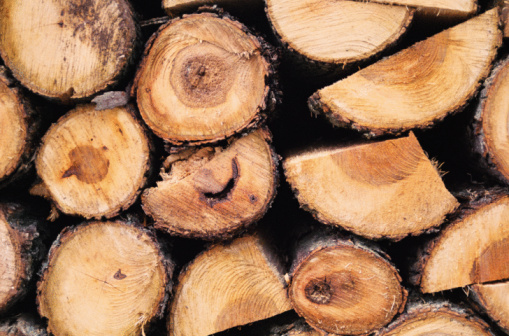 Use hardwood for fuel (larger sticks of wood from trees like ash, oak, eucalyptus or cedar). Stack the collected wood away from the campfire site for safety. Build your tinder with dry leaves, crumpled sheets of newspaper and other dried materials (organic if possible, to prevent toxic fumes). Place these loosely within the fire ring. Do not compact them, since it will prevent the flow of oxygen necessary to start a good fire. Allow enough proximity among the dry leaves, newspaper sheets and other materials for the fire to ignite well. Build your kindling: Place small pieces of fat wood and branches around the tinder you have set. Ignite the fire from below, at the tinder level. Encourage the flame to spread around by blowing into the center of the tinder. Continue adding more fat wood as you see necessary, until the kindling has caught a consistent burn. Start adding more hardwood, a little at a time. The size of the branches you add to the kindling should increase gradually. Don't place the largest branches yet. As a rule, add wood less than twice the diameter of the branches already burning. Continue adding larger branches as the fire continues to grow. Remember to place the branches carefully. Do not throw them into the ring.